much-needed quick fix when there’s no time to freshen up. 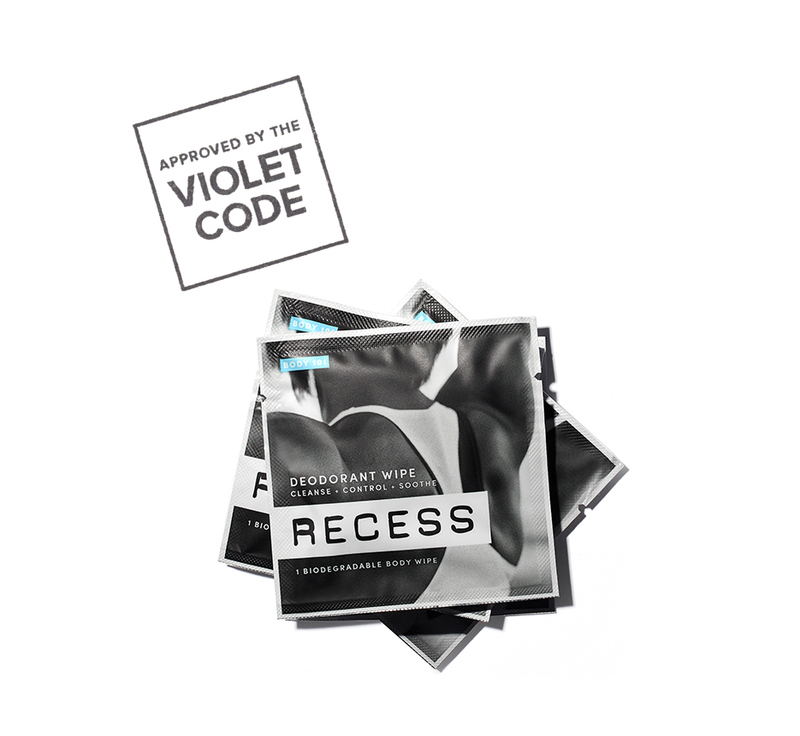 To be totally, totally honest, I wasn’t thrilled when Jayme, VIOLET GREY’s beauty director, asked me to write about Recess Deodorant Wipes. Given all the high-tech luxury tools and exclusive multi-hundred-dollar products featured on VIOLET GREY, I was hoping to test something that was, well, fancy. Deodorant wipes aren’t exactly that. But being a dedicated lover of wellness and clean beauty (you can read my other musings at The Moment), I accepted the assignment with a smile and told the team I would pick up the product on Friday at the store on Melrose Place. Through no fault of my own, I didn’t get to the store. I was running around the city, and as a former New Yorker I didn’t understand that you can accomplish only three things, max, in a single day in Los Angeles. At 7 p.m. I sat in my car, unable to make it home in time to get ready for W Magazine’s Golden Globes party at the Chateau Marmont, and realized I needed some deodorant. It had been a long day, and I was feeling less than fresh. Right then I could have really used a wipe. Monday I made it to VIOLET GREY, where I scooped up the Recess Wipes. I also snuck in a trial run of one of the luxe tools I’d been lusting over. (Side note: Did you know you can test the Dermaflash in store? I’m pretty sure I’m going to be purchasing one when I go back to see Jimena Garcia for my next brow appointment.) I went home with my new smooth skin, slathered on some SPF (Supergoop! Mineral is my favorite), and ventured over to the park with my daughter. We ran around like crazy, up and down the slide, on the swings four times, and two laps around the park. As usual, I lost track of time. When we got home I had all of 10 minutes to get ready for dinner at Sushi Park. Voilà! The perfect time to test one of the wipes. The package was easy to open, and the product smelled great. I swiped both pits and got dressed for the night. I asked my significant other if he noticed anything amiss, and he did not. In fact, he said I smelled great. The next morning, I was dragging. Too much sake. My daughter was up extra early and I just didn’t have the energy to shower before our morning trip to the local coffee shop. Again, the Recess Wipes came in handy. Maybe it was time to actually bathe, but with my new superpower wipes, why would I? Recess Wipes are aluminum free, a must when it comes to anything anti-odor. In place of aluminum, they use tea tree oil, which naturally neutralizes any odors. They don’t strip your skin like ones I’ve tried before, thanks to the chamomile, which is incredibly soothing. And the scent is a very subtle mixture of coconut and verbena. They are also free of a bunch of other toxic no-nos like parabens, sulfates, phthalates, and mineral oil. A couple of days later, in the essence of true journalism, I also decided to test them after a particularly sweaty Lekfit class. I showered and used a wipe. Eight hours later, I felt great. As I said, superpower wipes.